The Housing and Development Board (HDB) has responded to a Stomp query on Facebook user Max Tan, who alleged that he had been handed a summons by a Land Transport Authority (LTA) officer at 12.25pm on Thursday (May 24) after alighting his vehicle to help a woman in a wheelchair to a lift. In his post which has since been taken down, Max said that he had stopped his vehicle with the engine running on a Service Road next to Block 196A Punggol Field to help the woman. When he came back, he realised that he had been given a summons by an enforcement officer. Max attempted to explain himself, but the officer apparently told him that he had committed an offence by parking his vehicle on the service road, even if its engine was still running. 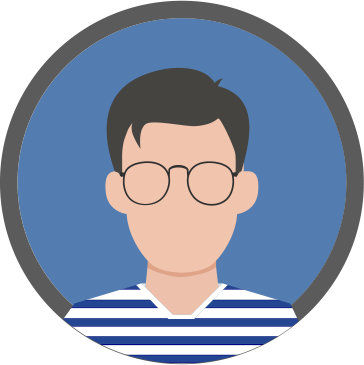 Max ended his post lamenting how cold Singapore had become as a society. 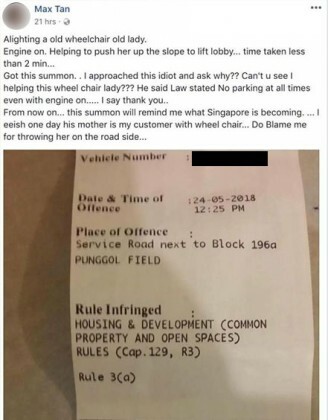 In response to Stomp, HDB said that based on its findings, the summons had been issued as Max had parked his vehicle illegally on the service road. It also noted that the vehicle had been parked there for at least 10 minutes, and the engines were turned off, contrary to what Max had mentioned in his post. This led to the LTA officer issuing the summons. HDB said that service roads must be kept clear at all times to allow access for emergency and essential vehicles, such as ambulances, fire engines and refuse trucks to the housing blocks. It added that illegal parking on the service roads will impede the movement of these vehicles and enforcement actions are necessary to ensure that the roads are kept free of obstruction. Referring back to Max's case, the HDB said motorists who need to alight passengers with restricted mobility can use the two loading bays nearby. The bays also come with ramps that facilitate barrier-free access and movement to the block. An investigation by the HDB revealed that the loading bays had been empty when Max alighted his passenger. HDB told Stomp that Max has not contacted them regarding the summons, clarifying that parking enforcement officers are not remunerated by the number of summonses which they issue. It would also like to remind motorists to be considerate and abide by parking rules. Uncle parks car on motorcycle lots, then tells biker: "Who the fish you are?"